Meanwhile lets just say that we are proud Annemarie van der Heijden contributed a whooping 27 entries. At the moment I am working on a new booklet about Noortje. The pictures betray me, it is about Saint Nicholas. Saint Nicholas is not here yet, but Noortje already can make here wishlist. So, Saint Nicholas is coming! But you have to wait with your wishlist, the book will be expected autumn 2018! 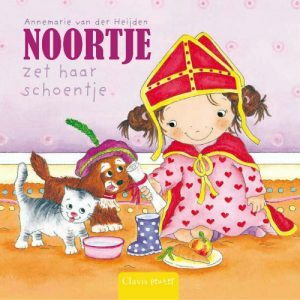 For all parents and children who love Carnival, Noortje Celebrates Carnival is released just in time for Carnival! An elf, a clown or a firewomen? A pirat! Maybe a bee…. Curious in which costume Noortje will walk the parade? I wish you a nice Carnaval! There were many children in the library of Asse (Belgium)! I read “Noortje Plays Doctor with Dolls”.